Here at The Launch Factory, we’ve written quite a bit about hot desk coworking. After all, it’s the most varied and even *adventurous* form of membership in a shared office space! No matter your industry or working style, hot desk coworking can be beneficial for you. Below is a compilation of past articles covering hot desk memberships. Whether you’re interested in the the basic tenets or the more nitty-gritty specifics, this resource should help you learn all you need to know about the hot desk style of coworking. So, what exactly is hot desk coworking? 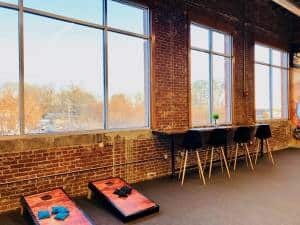 “A hot desk membership at a coworking space is a great fit for independent professionals who want a low-commitment, low cost option for an office. Hot desk memberships allow you access to any available (not dedicated) desk or work area; you come in each day and find a free spot. They are usually the lowest price tier that a coworking space offers. Can my corporation benefit from hot desk memberships? “A hot desk membership would be great for an employee that travels often or is otherwise away from the office. The best hot desk candidate is already mobile in their work, not bogged down with multiple monitors or too much paper. I’m a manager. How do I introduce my team to hot desk coworking? 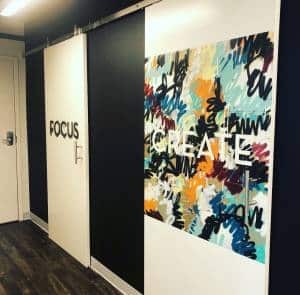 “Hot desk coworking is the ultimate flexibility: it’s usually the lowest price point offered by a shared office space, and is generally a month-to-month commitment. The novelty of not having a set space to work in- no desk to cram full of papers or office wall to plaster with sticky notes à la Carrie in Homeland- leaves some professionals weary. Will their productivity fall to pieces within a less structured system? Click the link below to schedule a tour of The Launch Factory, and try out hot desk coworking for yourself!